Basic update, 1.0.7, to support 1.32. – While there are visible models for all standard flatbed cargoes, I have not had time to adapt them beyond basic positioning. force me to drop support for all game versions prior to 1.32. 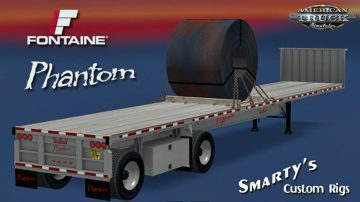 The Fontaine Phantom is a discontinued model of all-aluminum flatbed trailer that was produced in the mid- to-late 2000’s. 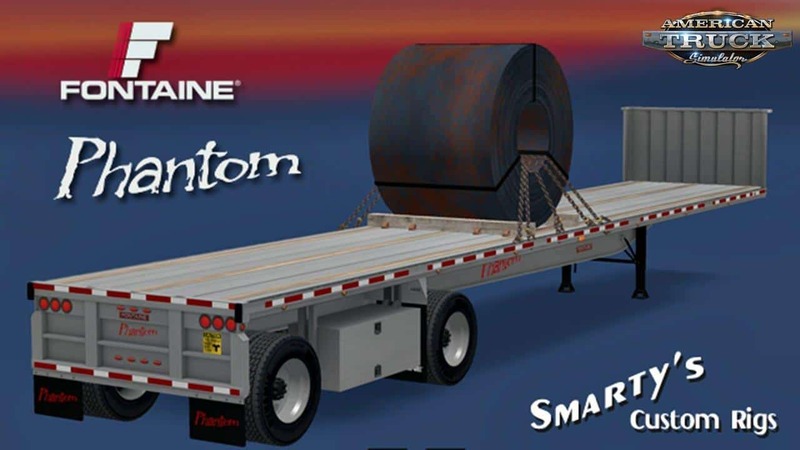 The trailer in this mod represents the most typical configuration of the Phantom; 48 feet long, 102 inches wide with spread axles. This is my first trailer mod for ATS, based on a vastly improved version of my original for 18WoS:PTTM. It is standalone, though it makes use of existing base game cargos where appropriate. 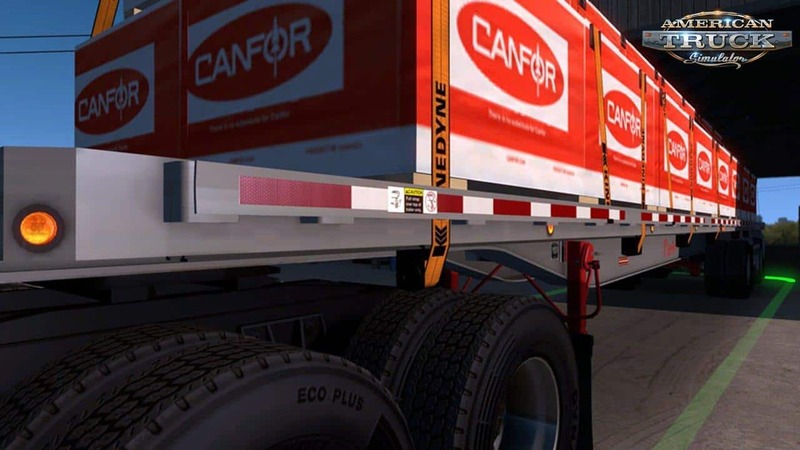 It includes a selection of original cargo models by myself as well as some adapted from the base game flatbed trailer. pay reasonable amounts compared to the base game content. 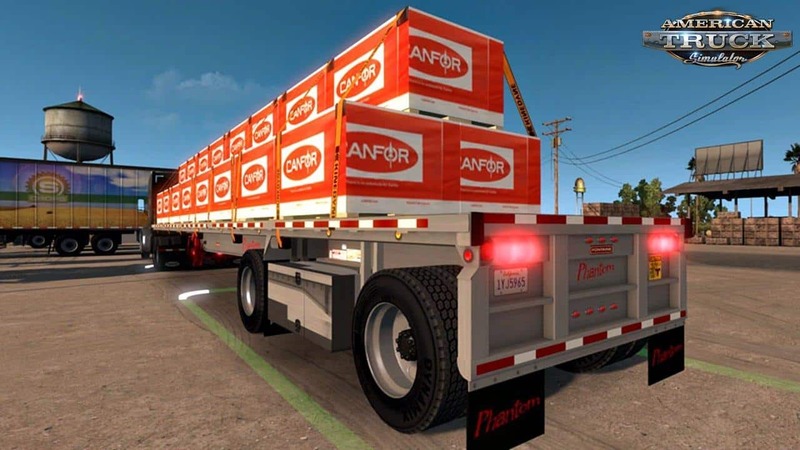 Advanced coupling is supported, as is the trailer picker where cargos are shared with the base game flatbed. Like my other mods, I will be adding and improving features in future updates. priority than the trailer, it will use the Goodyear G314 285/75R24.5’s. They don’t Show up for me i8n 1.31, using a new profile so its the only trailer in there. Does it need something else? It is for 1.32 and up only not for 1.31. And why are you still on 1.31? It is only for 1.32 and up not for 1.31. And why are you still on 1.31? It works only on 1.32 and up, so not for 1.31.